The Bruce Arena book is so good it’d be ripe for a screenplay, if only it had a Hollywood ending. TriStar Pictures turned the strikeout by Bernard Malamud's Roy Hobbs into a Robert Redford home run in “The Natural.” But the Arena book, the entertaining and informative memoir from America’s greatest soccer coach, is non-fiction. There’s no changing the fact that when Arena was employed belatedly to clean up the mess that Jurgen Klinsmann had made of the U.S. national team, Arena came up short. After Klinsmann had put the USA behind the eight ball with the first home World Cup qualifying loss to Mexico since 1972 and a 4-0 pummeling by Costa Rica, Arena presided over a 6-0 rout over Honduras in his first qualifier at the helm, a remarkable 1-1 tie with Mexico at Azteca, and a 4-0 beating of Panama. Arena also guided the USA to the 2017 Gold Cup title (a record third time he won that title). Comeback wins by Honduras over Mexico (3-2) and Panama over Costa Rica (2-1). The ball never crossed the line on one of Panama’s goals. Honduras equalized when the ball bounced off the back of Mexico goalkeeper Guillermo Ochoa’s head. Sometimes you shouldn’t judge a book by its cover and this is such a case. Only a sliver of the book, the final pages, are Arena’s proposals on how the American game can improve. The book is mainly about the most fascinating era of American soccer, told by one of the game’s most intriguing characters, and yes, perhaps it needs reminding – because the 2018 World Cup qualifying failure was such a heavy blow – the USA's most successful coach. Before Arena coached the USA to its best World Cup performance of the modern era, a quarterfinal run at the 2002 World Cup, he had won two MLS Cups and two international crowns with D.C. United in three seasons. Before that, at the University of Virginia, he revolutionized the college game by creating the most successful, entertaining, sophisticated team of a quality unmatched by any college coach not dependent on foreign players. UVA won five NCAA titles, including four in a row. Before getting called back by U.S. Soccer in 2016, he won three more MLS Cups with the Los Angeles Galaxy -– giving a him record total of five MLS crowns. The book is about much more than Arena. Consider just a few of the players he coached: John Harkes, Tony Meola, Claudio Reyna, Marco Etcheverry, Jaime Moreno, Landon Donovan, Cobi Jones, Alexi Lalas, David Beckham, Robbie Keane. We also get Arena’s account of his encounters with a wide range of other people, from inside the soccer world, such as Gordon Bradley, Shep Messing, Bob Rigby, Don Garber, and outside it, such as George W. Bush, Barack Obama, Tom Cruise –- and the ACC basketball coaches he used to eavesdrop on thanks to his UVA soccer office being next to the visitors’ locker room: Dean Smith, Jim Valvano, Lefty Driesell, Mike Krzyzewski and Bobby Cremins. “What’s Wrong With US” is co-written by the skilled journalist and author Steve Kettmann, whose several books include “Baseball Maverick: How Sandy Alderson Revolutionized Baseball and Revived the Mets,” and he also co-authored "What a Party!" with current Virginia Governor Terry McAuliffe. Kettmann’s influence is that Arena’s story is told in a most engaging manner, doing justice to what Arena is like in person -- a straight-forward New Yorker with a healthy sense of humor, who cares deeply about the players he has so often helped reach great heights. The cloud of not qualifying for the 2018 World Cup does not diminish the book's value as a history of American soccer -- its remarkable rise, the challenges it has overcome and those it continues to struggle with. Much of Arena’s own experience is intertwined and he has unequivocally been one of the sport's most important trailblazers. Arena is the son of an Italian-American butcher who grew up on Long Island. His sports ambitions were first focused on wrestling and lacrosse until he joined the high school soccer team on a lark and ended up replacing a red-carded goalkeeper – and did quite well. Arena went on to play both professional lacrosse and soccer (he was drafted by the Cosmos but ended up in the American Soccer League). His brief time as a player with the U.S. national team came during a trip to Israel during the Yom Kippur War cease-fire, one of the book's many highlights that reveal parts Arena’s career few would be familiar with. Who knew Arena had stints as a math teacher -- one of his students was Carl Sagan’s son -- typing instructor, bartender, sociotherapist, and high school truant officer? If the soccer fan still stung by the USA’s World Cup absence may be hard to convince that this is a worthwhile read, the class of reader that it will certainly appeal to is the coach. 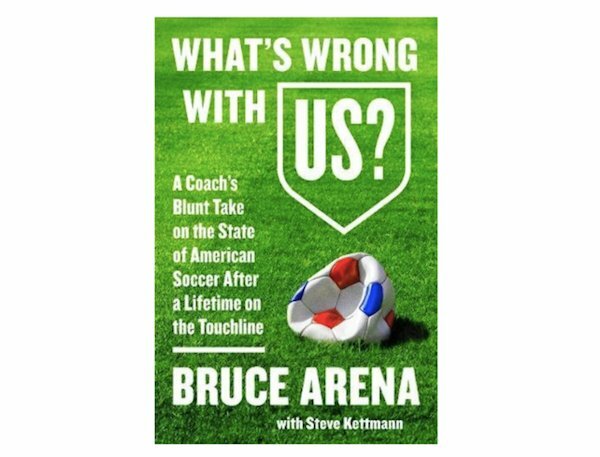 Arena’s accounts of the coaches who influenced him, the descriptions of his own relationships with players, and his successes and failures, make “What’s Wrong With US” more instructive and insightful than any Xs and Os how-to book you’ll find on the shelves. What's Wrong with US? : A Coach’s Blunt Take on the State of American Soccer After a Lifetime on the Touchline by Bruce Arena with Steve Kettmann (2018 HarperCollinsPublishers) 268 pages. Available in hardcover ($18.00), Kindle, and Audio. 14 comments about "The Bruce Arena Book: Why it's worth reading despite the T&T ending". Bob Ashpole, June 22, 2018 at 7:54 a.m.
My copy arrived last night and I am 40 pages into it. A very enjoyable book, difficult to put down. The book is intriguing. As far as the plot goes, we know how the story ends. The question remains, however, how did we get there? Wooden Ships replied, June 22, 2018 at 2:34 p.m.
Don’t know that I’ll get a copy, glad you did. I respect the body of work Bruce has put in and he has largely been successful in our country at all levels. I haven’t been a fan of his style of play preference and his views on who should represent our country. He sees through a telephoto lens rather than a macro. Bob Ashpole replied, June 22, 2018 at 6:54 p.m.
WS, I really don't have your insight. I can only comment on what I see. Second point. Bruce and every other MNT coach was picking players for a counterattacking team. Third point. That was the past. What about now? Can we start to play a more technical style? We have huge disadvantages. We don't have a Barcelona or Real Madrid developing highly skilled players and playing a more technical game. Basically we have no coach at the international level or in MLS that uses positional play. We have no profesional players with experience in positional play. You can hire Pep Guardiola to coach the MNT, but what is he supposed to do? The MNT coach doesn't develop players. You cannot build that type of team by pulling in a couple of players at big clubs in Europe. I have read people saying we have those types of players in the US, but they are not being selected. If that is true, then let's start by building a U23 team for the next Olympics using positional play and Dutch Style principles. The idea is that they will be playing the way the senior team will in the 2026 cycle. Think of it as a pilot program for 2026. Success at that level will allow USSF management to "buy in" to the change at the senior level. This pilot program would also provide a basis to compete with Mexico for dual citizenship players. The way things have been handled up to now, you cannot expect technical players with a choice to pick the US unless maybe if they are 6 foot tall. Fourth point. Why are the WNT still playing like they did 30 years ago. If we want to maintain our ranking, the WNT team needs to learn new ways of dominating the game. That is what positional play and Dutch Style principles are all about. Fifth point. In my view tactics vary with the opponent and the circumstances. Our teams need to be able to play more than one style. Right now it seems that we can only play one way and it is not pretty. The solution I see is we have to develop US players and US coaches who can dominate opponents with better technique and tactics too and not have to rely solely on determination, fitness and athleticism. Not easy. Not quick. And we need to use all the existing resources we have to their full advantage, instead of excluding them from the process. frank schoon replied, June 23, 2018 at 10:20 a.m.
Bob, I can't argue with that, you're are preaching to the choir. Ships, you know more about the 'inside baseball" than me and Bob when it comes to Arena and other aspects. Or for that matter both you guys are more familiar about the runnings ,the organizational aspects of USSF than I will ever know, that is why I just concern myself about the game itself. Ships, I enjoyed the "poop" you learned from some people on the "inside" why we lost to T&T. Bob Ashpole replied, June 23, 2018 at 5:05 p.m. I am almost through with the book and skipped ahead to the end to see what Arena had to say. His talk sounds a lot like I hear from you and others here. 1) The business people at USSF are making the technical decisions and they don't have enough knowledge of the game. 2) MLS is closing out US players. Initially over 60% of the rosters were US elegible players. Now the percentage has dropped to the low 40s with an accelerating trend. The result is our pool of field players is shrinking to a shocking extent. 3) Development opportunities for 17 to 21 are far too few. 4) We need to develop better players, coaches and officials. It is a long term project. and 5) the competition is getting much better. His list of problems doesn't include any x's and o's. Just better technical management, more playing opportunities and better participants all around. frank schoon replied, June 23, 2018 at 5:21 p.m.
Bob Ashpole replied, June 23, 2018 at 7:05 p.m. I don't think I would call it awful, but it was rather ordinary. Looked like amateur soccer rather than professional. Lots of bad passes and not much support off the ball. The announcer was saying that RSL had won several awards for "style." frank schoon replied, June 23, 2018 at 8:41 p.m.
R2 Dad, June 22, 2018 at 3:03 p.m. I understand that journalists need access so writing another love letter to Bruce Arena facilitates this, but I wish the criticism of players and coaches we see in basketball and football was present in soccer--it's not, in this country. Mexico-yes. Spain-yes. England-yes. Brazil-yes. True, I can sit behind a keyboard and rant and don't have to interact with these people in a 1v1 context. But I would like to see more clear-eyed analysis and less kissy face. Bruce Arena is a journeyman coach, who prefers to work with journeyman players. That's not going to cut it at the highest levels anymore. We need the kind of change that the USSF is unable to provide of their own accord. Giving Tab the USMNT might hide the deficiencies of the entire silo, but won't solve our long-term development issues. Not sure how throwing Klinsmann under the bus makes this a better article, Mike. frank schoon replied, June 22, 2018 at 5:40 p.m.
Ric Fonseca replied, June 22, 2018 at 9:39 p.m.
R2D2: Good points, especially just how much longer will folks continue to throw JK under the onrushing bus??? With all due respects, IMHO, SA, a soccer magazine/journal that I've been reading and contiributing to since the early 1970's (fyi, some time ago I sent my collection of SA's on to the National Soccer Hall of Fame when it was housed in Oneonta, NY, and even donated some to the LA 1984 Olympic Library) opted to do just what you say about "the on rushing bus," an unseeming bias that I am sure the founder/publisher would not have liked. Tony Biscaia, June 24, 2018 at 1:58 a.m. I was lucky enough to get to meet Bruce while I had media credentials and had some "insider views." I can certainly understand his success seeing how he dealt with players, media and various ups and downs without ever compromising his integrity. Hope he stays involved and remains a treasure trove of knowledge for our country and sport. Bob Ashpole, June 25, 2018 at 3:15 p.m.
Just finished the book. I hope every leader in MLS and USSF reads the final chapters and both organizations adopt the recommendations. While some of the recommendations may clash with MLS's business goals, USSF can force the changes to be made. I want to mention one recommendation in particular: that USSF consider adding promotion and relegation between the 2nd and 3rd divisions. I had never considered the issue in this way before. This is workable and with 20/20 hindsight it seems an obvious rejounder to the impractibility of applying the practice to MLS. beautiful game, December 18, 2018 at 5:26 p.m.